Looking for USB to Serial connections for your Fadal machine? Need effective Fadal file transfers? The USB Connect series will eliminate old technology on your CNC machines & bring new life to them with our USB solutions. Looking to add a USB port to your CNC control to transfer NC programs? Our USB Connect products streamline loading & saving of part programs via USB connectivity, as well as drip-feeding to CNCs. Our USB Connect product, in Portable & Pendant models, has flexible DNC firmware built into the unit, allowing connection to just about any machine tool CNC control with a USB directory listing. 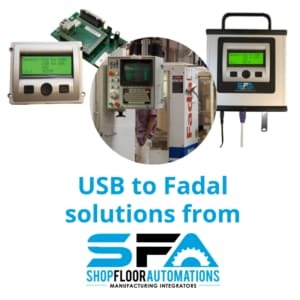 Ask about USB to serial controllers for Fadal machines, and more!